This week in bookish history, On the Road by Jack Kerouac was published on September 5th, 1957. Kerouac was the poster child for the Beat Generation, a group of free-thinking writers that wanted to shake up the establishment with new ideas and behaviors. Characterized most notably by drugs, poetry, beat music and open sexuality, the authors who helped define this movement also included Allen Ginsberg (Howl) and William S. Burroughs (Naked Lunch). On the Road, however, over the course of time has become the most recognizable and (due to it's popularity), the most representative of the changing times. Kerouac first wrote On the Road as a series of notes taken while actually on the road, travelling with his friends across our great land, smoking pot, drinking booze and loving life like one can only get away with while in their twenties. Over the course of three weeks, Kerouac then compiled his notebooks full of memories and observations into a fictional and notorious first draft simply known as The Scroll. 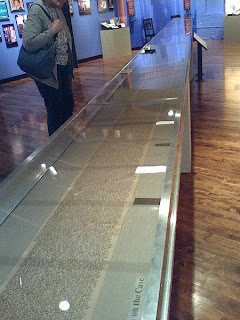 The Scroll measured one hundred and twenty-feet and consisted of typed on and taped together tracing paper. You can check out The Scroll for yourself at The Boott Cotton Mills Museum in Lowell, Mass. Although On the Road was met to mixed reviews upon its publication, it had stood the test of time since and has proven to be on of the most influential novels of our time. 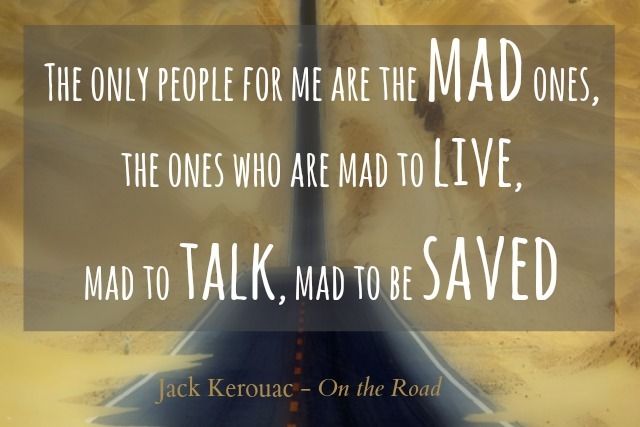 So here's to you, Jack Kerouac, thanks for inspiring us to hit the road and stay "mad" for over half a century! You need to insert quotations in a formal manner each time you wish to draw an example or recall an interesting fact from the: book, newspaper, magazine, look cite a quote from a book here.